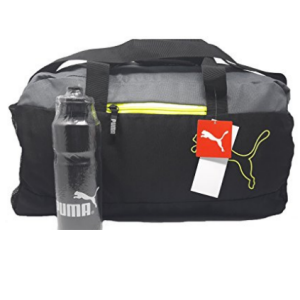 Amazon is selling Puma Sport Duffle Gym/Travel Bag + Free Water Bottle 650 ml Rs. 790 only. Dual handles, Detachable padded shoulder strap. External lined personals pocket, Main top zip pocket. Durable design with contrast Puma brand logo. FREE PUMA WATER BOTTLE WITH THIS BAG.